Like any sport, the equipment plays a big part in keeping the athlete safe, enhancing their performance, and bringing a certain experience to the sport. Here’s a roller derby equipment guide. Dual impact helmets have become quite popular. Protecting your brain is critical. Do your research and find a good, reputable brand of helmet. Helmets should also be replaced after a hard hit or fall where the helmet is impacted. As well as over time since transporting your helmet can cause it to get damaged. Check over your helmet (and all your gear!) regularly to spot any cracks or tears that could cause the equipment to fail during use. See a selection of helmets here. Many skaters prefer a heat moldable mouth guard that can form fit to their specific teeth. You want to keep your teeth safe while also being able to communicate with your teammates on the track and drink when you’re on the bench. A popular and inexpensive brand of mouth guard is Protech. There are many different brands and types of kneepads available. Some are low profile, some have designs, and some have extra padding. Finding the right style and shape of knee pads will require some shopping around and even trying on your teammates’ or going to a skate shop in person to see what is available. Our knees take a lot of impact during derby. Many of the falls that you will learn and take will involve impact to your knees. Therefore, you want to make sure you have durable and protective gear to keep them safe and free from injury. While elbowing in roller derby only occurs on TV, your elbows are still going to come in contact with other skaters and sometimes the floor. Like knee pads, you will find that there are different types of elbow pads. Some will have Velcro straps and just wrap around your arm and some will have a cuff. Some are low profile and some are bulkier, but in turn offer more padding. Many falls will end with you bracing the floor with your hands. You want to make sure your wrists are protected so they can continue to support you. Unlike the other types of equipment, there aren’t too many different types of wrist guards, but there still are some differences. Some are low profile and lightweight where others might be bulkier but offer more support. Roller Derby wouldn’t be roller derby if athletes didn’t have skates. And not just any skates. Here’s a helpful guide to roller derby skates and their components. Here is a selection skates and skate components. The derby roller skate is composed of 4 main parts: The boot, the plate, wheels, and toe stop/jam plug. 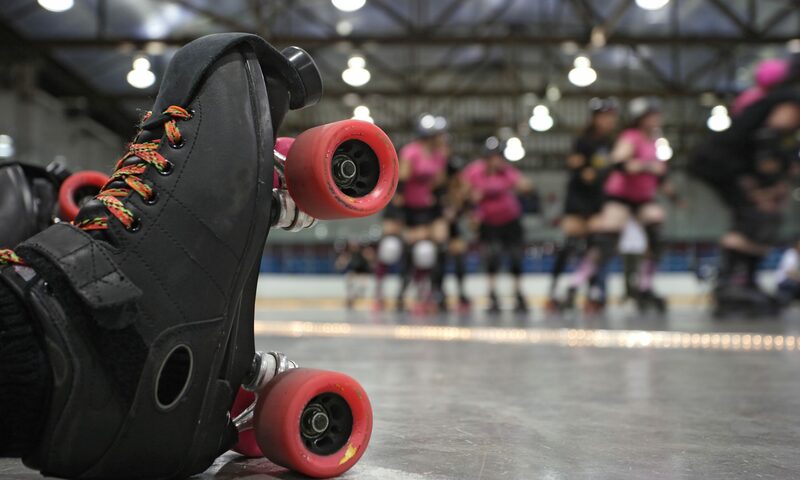 There are many, many, many different brands and types of skates available these days to roller derby skaters. Low cut boots, high cut boots, traditional black boots or camo print boots. Some companies are even allowing you to choose and design your own boots as well. Like with other types of equipment you will want to try different types of boots on. Often times booths will be set up at local derby tournaments or games. This is a great time to try on all the different styles and figure out which works best for your feet. Wheels come in many different brands, styles, and grip. They are primarily categorized by their ability to grip or slide. For example there are wheels with a hardness of 86 and there are wheels with a hardness of 100. The 86 wheels are going to be softer and grip the ground more whereas the 100 wheels will give more slide. Either can be preferred depending on your skating surface (smooth versus slick) or your job on the track. If your job is to be a jammer you don’t want to skate with wheels that are going to slow you down and grip the floor. You will want some that are a bit faster. Just as if you are skating on a newly sealed rink floor you might find that harder wheels are going to work better in conjunction with the grippy floor surface. On the contrary if you are skating on some polished concrete you might find you have better control with a softer wheel. Slowly building a collection of wheels will be helpful for skating on different surfaces, especially if you travel with a team and will be skating at more than one rink. It is good to note that different brands of wheels can feel different when skating. A 96 from one brand might seem really slick when compared to a 96 of another brand. Just like with most of the other gear you will buy, wheels are another item you will want to try out and see what works for you. You might also find that you want to combine different wheels so that your inside wheels have grip while your outside wheels have more slide. Recently companies have even introduced combo wheels that have two different types of grip on one single wheel! A toe stop is an often overlooked piece of equipment. Toe stops are integral in some stops (turn stop) and can also enable a skater to utilize their skates for running or to perform tighter more ballerina like turns. Top stops come in different variations. You can also adjust the height of your toe stops based on your ability and need. Some skaters prefer to not use Toe Stops. Armbands or numbers clearly written on your upper arm. Sharpie works well for this, they also make temporary tattoos you can purchase. Some people even permanently tattoo their number on their arm. There are companies that make custom designed bags just for skates (check out Red Reed Bags). They often have separate compartments for wheels, tools, skates, gear, and water bottles. This can be really handy in keeping oneself organized, especially if you have to grab something quickly. However, they can also be more expensive than a regular athletic bag. Some skaters even use suitcases. Having a bag on wheels can be handy when you’re transporting your gear a lot for away games. And some bags even have a built in seat for you to put your skates on (see Zuca bags). Some things to consider when buying a bag: What is my budget? Do I want it customized with my team’s logo? Will I be taking this bag on an airplane? 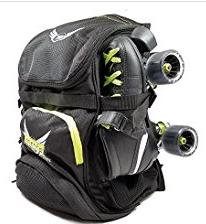 Not all commercial skate bags will fit in an overhead bin, and do you really want to risk checking your skates? What is your preferred method of transport? Backpack? Wheely bag? Check out the opposing bench at games and your teammates’ bags at practice. Most skaters will be happy to show you what they use and answer any questions you may have. You probably received a basic skate tool when you purchased your skates. It gets the job done, but it probably isn’t the easiest tool to use. In fact, it could make removing your skate wheels cumbersome. 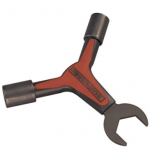 Eventually you will want to upgrade your tool to something that is more versatile, and useful like this skate tool. Some skaters like to wear loud or decorative “Boutfits” while others just like to keep it simple with blank leggings and a uniform top. Just be aware of the infamous fishnet burns when wearing tights or fishnets. Leggings can offer you another layer of protection, even if they aren’t as exciting. Some skaters like to have extra protection for their shins. You will find that sometimes on the track you will be kicked or hit by another skater’s skate while in the pack. While these hits are normally accidental they still hurt! If you find yourself with heavily bruised shins, shin guards might be for you. Sport goggles or face visor must confirm to WFTDA’s rules. Even though hits to the face and head are illegal, they can still happen incidentally. Eye protection can help everyone, especially those who are wearing glasses while they skate. 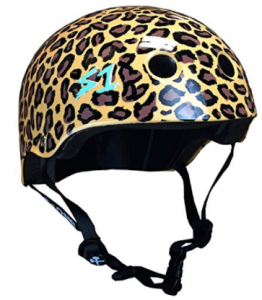 Please note that special rules apply to helmets that have visors attached to them. You must adhere to the safety guidelines put forth by WFTDA. Helpful for taping up body parts that might need extra support after an injury. A bearing press is used to change out bearings on wheels. From time to time you will need to clean or replace your bearings. 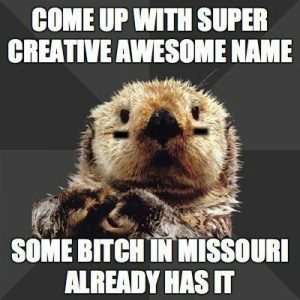 In the beginning, if your budget is tight, or you are unsure about how long your commitment to roller derby will last, you might find you are able to borrow this tool from a friend. Sometimes leagues will even organize skate maintenance parties and someone will have one of these available to use.